Every year, I tell myself that on March 14th I’ll make a pie for Pi Day (you know, 3.14… 3/14…). And every year, I don’t. Something gets in the way–and it’s usually because I’m making myself a pile of different birthday cakes. This year, however, the cakes can wait. First, I’m celebrating Pi Day with So Delicious Dairy Free to raise money for Kids with Food Allergies via their Instagram contest called Pi(e) 4 All (#Pi4All). 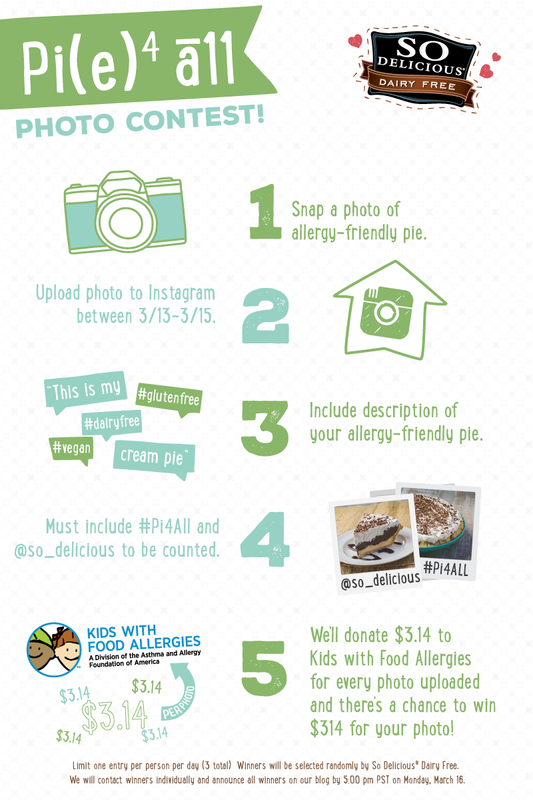 For every photo of an allergy-friendly pie uploaded to Instagram between March 13th and March 15th, So Delicious will donate $3.14 to Kids with Food Allergies. And it gets better: one lucky winner will receive $314 for their photo and 10 random winners will receive 3 VIP coupons redeemable for So Delicious treats. Check out the full rules here. In other words, you just might want to make a pie and upload it to Instagram. So my pie? 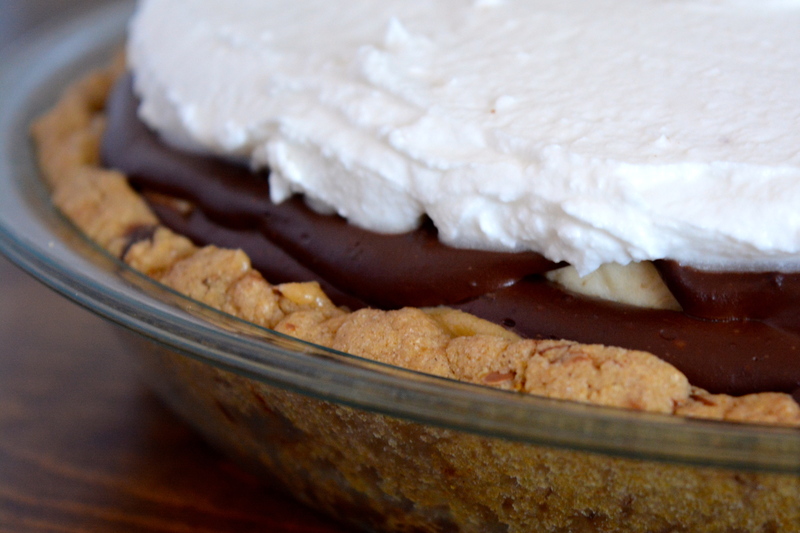 This one is starting with a chocolate chip cookie crust, and features layers of creamy tahini-caramel, fresh bananas, rich chocolate pudding, and fluffy whipped cream. 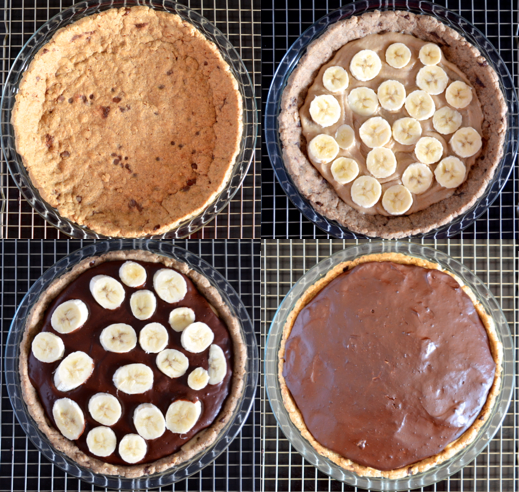 Versions of this are part of my regular pie rotation: my other favourite combination includes strawberries in place of the bananas, peanut butter (though not allergy-friendly) for the tahini, and the “graham”-style crust in my Pies and Desserts book. And one last thing. Before you get started, be sure to refrigerate the Culinary Coconut Milk the night before. The day before making the pie, put the container of the Culinary Coconut Milk in the refrigerator to chill for at least 12 hours. To make the crust, preheat the oven to 325 degrees F. Lightly grease a 9-inch pie dish. Put the vegan buttery spread and brown sugar in a saucepan. Cook on low heat for about 3 minutes to melt the buttery spread and dissolve the brown sugar. Scrape the mixture into a large bowl or the bowl of a stand mixer. Add the Coconut Milk Beverage, ground flaxseed, and vanilla extract. Using the stand mixer or a hand mixer, beat on medium-high speed until well mixed and emulsified. Put the sorghum flour, tapioca flour, xanthan gum, baking soda, and salt in a medium bowl. Whisk well to combine. Turn the mixer to low speed and beat to combine. Stir in the chocolate chips. Press the mixture into the bottom and up the sides of the dish. Bake for 12 to 15 minutes, until just firm to the touch. Cool completely. To make the tahini-caramel, put the tahini paste and vanilla extract in a food processor. Put the water and the brown sugar in a small saucepan. Bring to a boil on high heat and cook for 90 seconds. Remove from heat, add the vegan buttery spread and salt, and let cool slightly. Pour about half of the mixture into the food processor. Process until smooth, adding just enough more of the brown sugar liquid until the mixture is creamy and thick. Spread about half of the mixture into the cooled chocolate chip cookie crust. Top with a layer of bananas (this will be about 1 of the bananas). Spread with the remaining mixture. Put in the refrigerator while making the pudding. To make the chocolate pudding, put 1 cup of the Coconut Milk Beverage in a saucepan. Whisk in the cornstarch until smooth. Add the remaining Coconut Milk Beverage, sugar, cocoa powder, and salt. Bring to a boil on medium heat and cook until thickened, stirring constantly, about 3 minutes. Remove from heat. Add the chocolate chips and vanilla extract. Whisk until the chocolate chips are melted. Let cool about 10 minutes. Remove the pie from the refrigerator. Pour in about half of the pudding mixture. Top with the remaining banana slices. Pour the remaining pudding mixture on top, spreading evenly. Refrigerate until completely cool and firm, about 3 hours. To make the whipped cream, cut off the top of the Culinary Coconut Milk carton with sharp scissors. Spoon out the hardened coconut cream into a large bowl or the bowl of a stand mixer. Add the icing sugar and vanilla extract. Using the stand mixer or a hand mixer, beat on high speed until light and fluffy, about 1 minute. Spread the mixture onto the top of the cooled pie. Refrigerate until serving. Store leftovers in the refrigerator. Blueberry season or not, this simple recipe takes a few moments in the food processor to bring you creamy (and, dare I say, healthy) goodness. It’s the next stop in a series highlighting my newest book, The Allergy-Free Cook Makes Pies and Desserts. Just like all of my other recipes, it’s free of gluten, dairy, eggs, and soy, but also legumes, peanuts, seeds and yeast. Cara is the amazing brain behind Fork and Beans, a website that is infinitely creative when it comes to gluten-free and vegan baking and cooking. You can visit her website for a review and the recipe, but be sure to have time to spare to explore her awesome recipe archive and her book, Decadent Gluten-Free Vegan Baking. 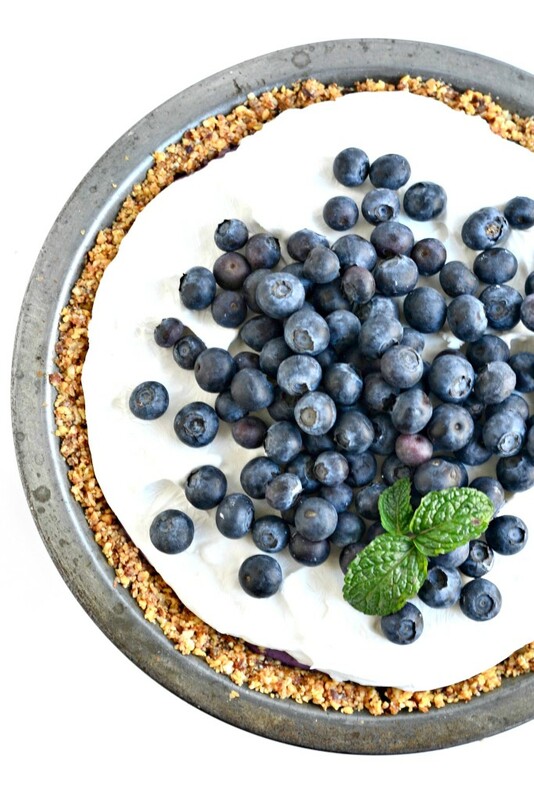 Check out the recipe here: No-Bake Blueberries and Cream Pie. The combination of tomatoes and peaches is already a winner, and neutral potatoes hold form to make a pie. Serve alongside a simple salad for a light summer lunch. Preheat the oven to 375F. Lightly oil a 9-inch glass pie plate and evenly distribute the potato slices, covering the bottom and a little up the sides. Ensure there are two layers and no holes. Bake for about 15 minutes, until the potatoes are softened. Meanwhile, slice the tomatoes in half and season with salt and pepper. Transfer the tomatoes to a baking sheet and, when potatoes are finished, increase the oven temperature to 425F. Bake the tomatoes for 20 minutes. When tomatoes are finished, put them in your food processor with the tomato paste, garlic, basil, oregano, and agave nectar. Process until almost smooth. Scrape the mixture into a saucepan. Turn to medium heat and cook until thickened, about 4 minutes. Spread the sauce on the potatoes (you’ll only use about half… use the other half as a dipping sauce for roasted potatoes… trust me). 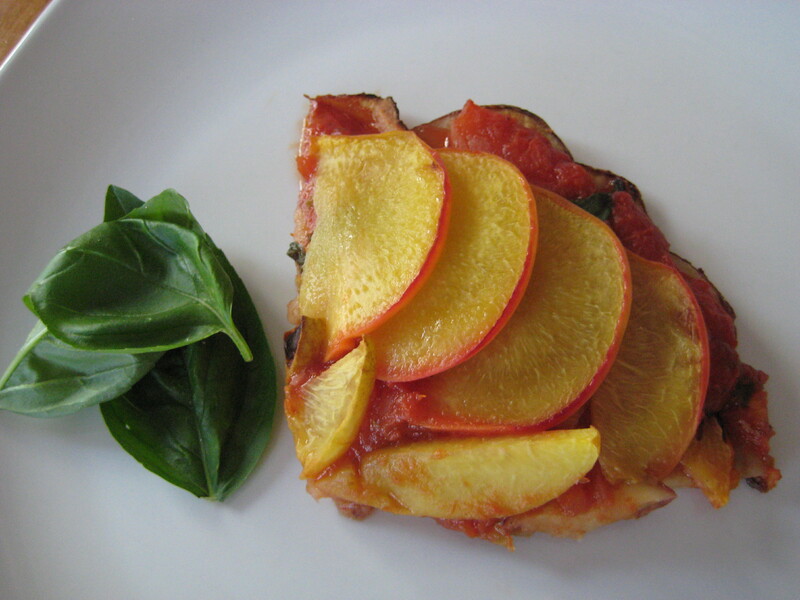 Top with the sliced peaches. 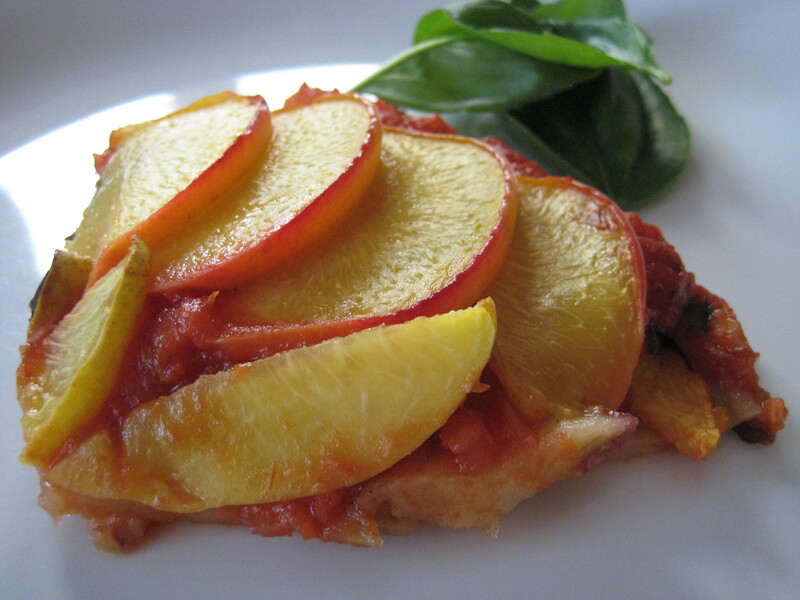 Bake for 20 minutes, until the peaches are softened and starting to caramelize. Let stand 10 minutes before cutting and serving, or serve at room temperature.